The name Sleights means 'flat land near water'. This must refer to an old location for Sleights, as presently the majority of the village is located on hillsides on either side of the River Esk. The houses in Sleights are more modern than the houses in other villages in Eskdale, probably because Sleights was still growing at quite a pace, even late into the twentieth century. 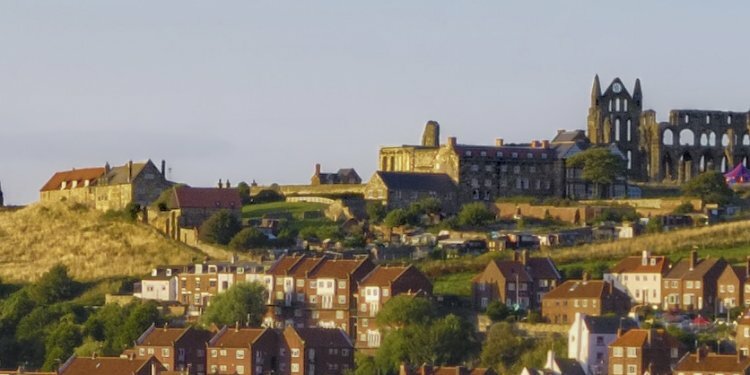 Sleights boasts some fine public houses and a hotel, it is quite close to Whitby making it an ideal place for the visitor to stay if they wish to be between the town of Whitby and the moors. The prefix of the Post Code for Sleights is YO22-5. Sleights is a picturesque village on the banks of the River Esk. The river here is broader and more easier flowing than further up in the dale. The bridge spanning the Esk is a magnificent stone and steel structure that spans not only the river, but also the Railway Station. The road that the bridge supports heads south through the village past the post office, butcher, general store, fish & chip shop, Antiques shop, and a public house before it starts climbing a steep gradient up on to the moor. This hill is known as Blue Bank, and drivers of heavy vehicles should be wary as many lorries have come to grief here. As you head south along this road, look to the left and you will see the dale known as Littlebeck. This is a very beautiful little hamlet that has a custom every August of crowning a local girl as the 'Rose Queen' and floating her down the river on a raft. If you head north from Sleights you will meet the main Whitby to Guisborough road (A171). At this point there is a memorial to the first German aeroplane shot down in World War Two. It was detected by the radar at RAF Danby Beacon and shot down by Peter Townsend, who in later life as Group Captain Peter Townsend had an ill fated affair with the Queen's sister, Princess Margaret. Sleights has two Churches, one Anglican and one Roman Catholic. In times gone by it had a chapel about one and a half miles upstream, which was was described as far back as 1762 as a 'poor mean structure covered in thatch situated in a damp place near the River Esk'. This Chapel was the source of one of Whitby's oldest customs, the planting of the Penny Hedge. On the 16th of October 1159 three local men were hunting wild boar and were chasing an animal through the woods. The Wild Boar saw the Chapel and took refuge in it, not knowing that it was the home of a hermit monk. The monk hid the boar in one of his cells and refused to let the hunters in to kill the animal. The hunters were so enraged that they beat the monk severely with their boar staves. The monk was so badly injured that he later died from his injuries, but not before telling the tale to the Abbot of Whitby and begging for the men not to be prosecuted for their crime on condition that they and their successors paid a penance for their sins. The penance was that on sunrise on the eve of Ascension Day every year these men or their successors should collect some short staves from Eskdaleside, the price of which should not exceed one penny. They should personally carry them to Whitby and arrive before nine o'clock that same morning. At nine o' clock they had to plant the staves in the mud in the harbour and weave a small hedge that was strong enough to withstand three tides. If the hedge failed before three tides had come and gone then all the lands belonging to these three men or their successors would be forfeited to the Abbott of Whitby or his successors. There was a clause in the penance which said that if ever the tide prevented the planting of the 'Penny hedge' then the penance should cease. This ceremony was performed for over eight hundred years without the hedge giving way before three tides until in 1981 the site was covered by eight feet of sea water and the descendants of the three men were released from their penance. The ceremony still carries on but if the hedge should fail then the descendants lands are now safe ! to who we offer our thanks for their permission to use it. If you have any knowledge or have information about local History, Folklore, Geology & Archaeology which you think would be of interest to other please contact us.